Published by G2A.COM sp. z o.o. 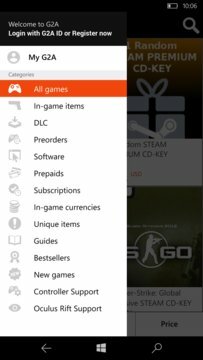 G2A is a free app with ALL games for EVERY platform in ONE place. Compare dozens and dozens of offers and buy cd game keys for Steam, Origin, Battle.net, Uplay, Xbox Live, PSN - anytime, anywhere! Thousands of digital gaming products for every gamer! 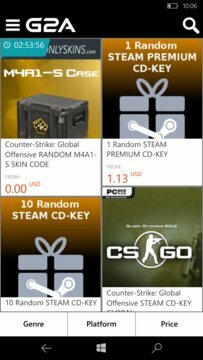 Install the app to discover the entire offer including cd game keys, DLCs, in-game items, software, prepaids and subscriptions. Buying on G2A gives you the lowest price guarantee. No need to look elsewhere – all the best deals are already here! G2A Shield - Buy with 100% Satisfaction and a 5 Minute Money-Back Guarantee within the entire G2A Pay Ecosystem. Talk to us: G2A is constantly working on improving your gaming ecommerce experience. Please continue to expect more features, improvements, and updates. If you want to contact us about anything from a support query to suggested improvements, please email us at windows@g2a.com.